Enchanted Garden Video Slot Guide & Review - Casino Answers! Enchanted Garden is a 5-reel, 20-line video slot featuring scatter wins, wild substitutes, a free spins feature and a progressive jackpot. 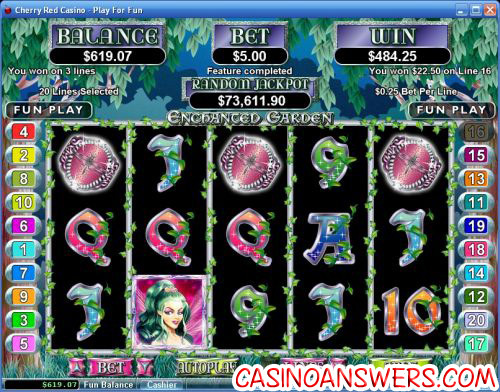 You can play Enchanted Garden at US-friendly RTG casinos such as Cherry Red Casino and Slots Oasis Casino. The Enchanted Garden video slot has a magical garden-type theme to it. Obviously, because of this, it’s very colourful which makes for a very attractive video slot. Enchanted Garden’s game symbols are the Scattered Garden symbol, the wild Fairy Princess symbol, a unicorn, rubies, a butterfly and A, K, Q, J, 10 and 9 symbols. All symbols pay from left to right except the Scattered Garden symbol, which pays any. Wins on different paylines will be added. Scatter wins will be added to regular payline wins. Scatter wins will be multiplied by the total bet. Line wins will be multiplied by the bet per line. Only the highest win per payline will be paid out. The maximum win per paid spin is 50,000X bet per line. Enchanted Garden has a randomly triggered progressive jackpot. The progressive jackpot can be won on any spin you make in Enchanted Garden. It is triggered at random. Progressive jackpot wins are added to your other wins in the game. Progressive jackpot contribution is no more than 1.5% of the total return to player. To increase your chances of winning the Enchanted Garden jackpot, make sure to wager as much as you can per spin. At the time of this writing, the Enchanted Garden Random Jackpot is at nearly $74,000. The wild symbol in Enchanted Garden is the Fairy Princess symbol. The Fairy Princess will only appear on the second, third and fourth and fifth reels and will substitute for any symbol except the scatter symbol (Garden). Your prize will be doubled when one or more Fairy Princess symbols substitute for a symbol in a winning combination. If a Scattered Garden symbol appears on the first reel while the wild Fairy Princess symbol appears on the fifth reel, you will win 7 free spins with a 3X multiplier. During the free spins feature, some of the symbols will have a background firefly symbol. Whenever three or more firefly symbols occur anywhere on the reels during this feature, you will win up to three more free spins. All prizes will be tripled during free spins. The feature cannot be re-triggered. Free spins are played at the paylines and bet of the triggering spin. The Enchanted Garden video slot has a skill stop feature. This gives the player the ability to decide when to stop the video slot game’s reels whenever he or she chooses. To use this feature during a spin, hit the “Stop” button where the “Spin” was when the reels were static. For players who would like to play a lot of spins without having to click the “Spin” button too many times, Enchanted Garden has an autoplay mode. Options available on Enchanted Garden’s autoplay mode are: number of spins, stop when jackpot is won, stop if a win exceeds or equals (any inputted value), stop on any win, stop if your balance increases by (any inputted value), stop if your balance decreases by (any inputted value) and stop once feature is triggered. You can cancel the autoplay mode at any time. We really thought Enchanted Garden was a lot of fun. The free spins feature seemed like it went on forever, which may be the furthest something going “on forever” has ever been from a complaint. It has a very large random progressive jackpot, which adds another layer to playing a slot machine. RTG has done a top-notch work with the presentation of the video slot, from the graphics and animation to the music and sound effects. They did a great job trying to capture the feeling of an enchanted garden and encapsulating it into a video slot. If you’re looking to try the Enchanted Garden video slot, we recommend you take advantage of the enormous $7,777 signup bonus at Cherry Red Casino. Where can players based in the United States play Enchanted Garden? Players from the United States don’t have to worry – you can play Enchanted Garden at most Realtime Gaming casinos, including both Cherry Red Casino and Slots Oasis Casino. These two RTG casinos are two of our favourites at Casino Answers and if you sign up, deposit and play at one of them, you will find out why! Does Enchanted Garden have a bonus game? No, there is no bonus game feature on the Enchanted Garden slot. However, there is a free games feature where you can win numerous free spins. You can trigger this special feature when the scatter symbol appears on reel 1 and the wild symbol appears on reel 5. You will win seven free games plus triple your winnings. You’ll be able to win more free games during the feature as well. Is there a progressive jackpot on the Enchanted Garden video slot? Yes, Enchanted Garden has a progressive jackpot, and a rather sizeable one at that! The Enchanted Garden progressive jackpot is triggered randomly, so any spin you make can trigger the random jackpot. The only question is – which spin will it be? Make sure to bet as much as you can to increase your chances of triggering the Enchanted Garden Random Jackpot. What is a good fairytale slot machine?